I found a new resource for the beloved Chinese Chippendale chair and this chair looks very much like a chair that I spotted at the beach a couple of summers ago that was about $650. This chair from Design Toscano is half that price. Still not inexpensive, but within the realm of normal. I can't tell if it's just the image or the actual chair, but it appears to have an almost tortoise-like finish to it. I think the whole chair is splendid and would look so, so, so very good as a set in a dining room. 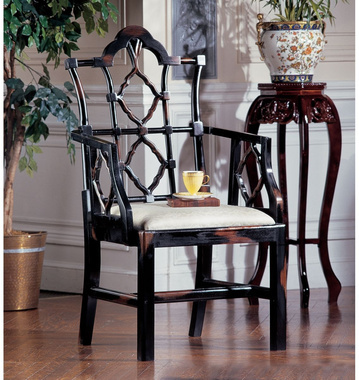 I also prefer this type of Chippendale chair to the more ubiquitous (yet equally attractive) bamboo styles because it's a little different, but still classic Chinoiserie. If you're in the market for these chairs, I hope this is a helpful resource! That is a great find....and a great price! They look similar to the chairs from Noir LA. Saw it and thought the same thing, great price! Gump's had a similar chair a while back. Oh boy, IM in love with that chair. Thanks for the tip! I had my eye on this chair, too and saw it on Toscano. It was at Gumps, then went off the market and showed up at Horchow's for over 200 dollars more per chair, then after x-mas, I walked into Gumps and low and behold I was able to purchase two of them for a deal steal of 50% off at 199.00 each. Note: The chair has returned on line at Gumps at it's original price.